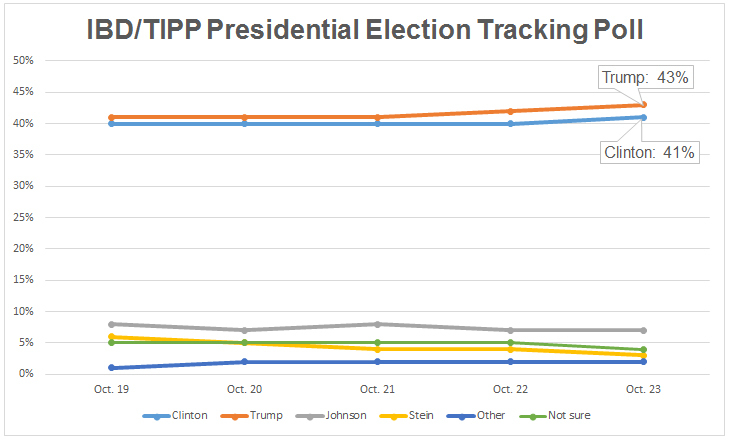 The IBD/TIPP poll — a collaboration between Investor's Business Daily (IBD) and TechnoMetrica Market Intelligence (TIPP) — has been the most accurate poll in recent presidential elections. The latest results for the IBD/TIPP Presidential Election Tracking Poll will be released each morning by 6 a.m. (ET). Maybe are starting to notice things such what I noticed on CBS OTA news when I tuned in to get weather. Specific actions vs yada, yada, yada. The very briefly mention Trump and his contract, hiring freeze and term limits. Hilary got air time to let us know as soon as she's president she'll be ready to talk about thins.